For the meatballs: Pour the ground beef in a metal bowl and add the beaten egg, seasonings and breadcrumbs. Combine well with your hands and form medium-sized balls. Place the meatballs on a tray lined with wax paper. For the sauce: Wash your hands and prepare the broth. For this, use a deep pot or one that you use to cook soup. Add the tomato puree and chipotle to the chicken broth. Then add the cumin, salt and pepper. Stir and mix well and let the broth come to a boil. For the dumplings: Combine the cornmeal with salt and a little water to make a soft dough. Form small balls of dough and set aside on a plate. When the broth is hot, add the carrots and meatballs one by one. Finally, add the dumplings. Cover and cook the meatballs and dumplings over medium heat without stirring the dumplings. The meatballs are done when the broth achieves a thick consistency. To make this dish less spicy, use only 1/3 cup of chipotle puree. Make the puree by blending canned chipotles in a blender. You can use ground beef or chicken if you prefer. Serve with slices of avocado. Meatballs are a simple but very tasty dish. At home I make my meatballs out of ground turkey or chicken, and they're always a success. When I prepare for a soccer match, I don't like to overcomplicate things; after all, I love watching and enjoying the game too! These turkey meatballs with dumplings are very easy to prepare if you're looking to feed a large group. They can even be cooked a few days in advance to save time and also let the flavors soak in. 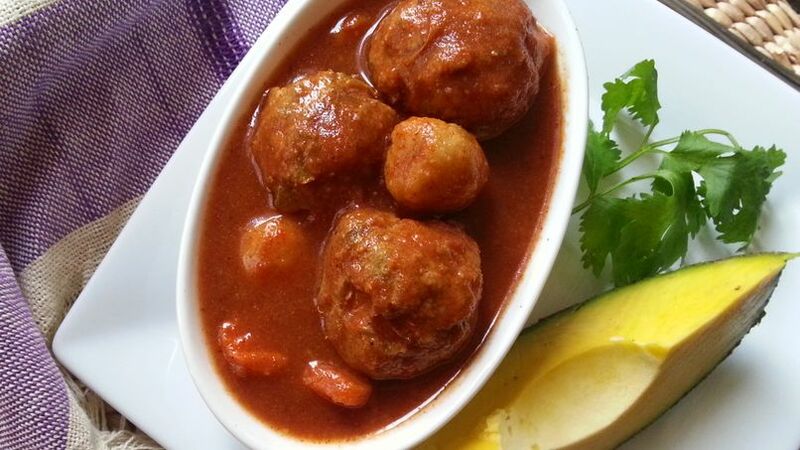 I invite you to prepare this recipe for turkey meatballs and dumplings in chipotle to delight all your fellow soccer fans. Let's get cooking!